“AUS series”in reliable quality by more than 50 years processing results. 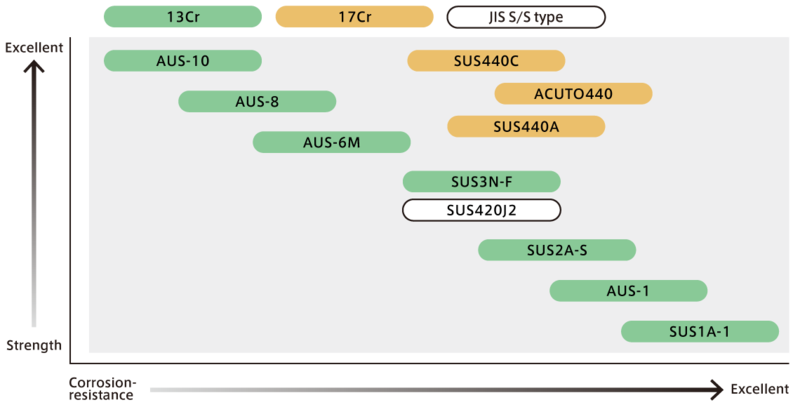 SUS1A-1 SUS1A-1 has the least amount of carbon among 13 chrome steels. As a result, among 13 chrome steels,SUS1A-1, has superior corrosion resistance with cold rolling and welding ability. AUS-1, SUS2A-S are increased carbon contents,improved heat treatment hardness and wear resistance. Use is medical equipment and others. SUS3N-F Add sulfur to SUS420J2, improved machinebility. Use is gauges. SUS420J2 JIS steel type,uses are popular knives,gauges. AUS-6M AUS-6M,AUS-8 and AUS-10 are increased more carbon contents,added vanadium and molybdenum,improved more hardness,wear resistance,annealing resistance. Uses are high-quality knife,scissors,pocket knife,medical equipment, food machine,mechanical parts and more. SUS440A These steels have corrosion-resistance and wear resistance at the same time. Improve wear resistance 1.SUS440A 2.ACUTO440 3.SUS440C（improving wear resistance） Uses are high-quality knife,hairdressing or cosmetic scissors,medical equipment, gauges,food machine,mechanical parts,automobile parts and more. ※1 Possible to manufacture each 1.0mm thickness. ※2 Possible to cut any length,but we have basic length by thickness. ※3 Possible to manufacture each 1.0mm thickness. ※4 Possible to cut any length,but we have basic length by thickness.